Clay Matthews and the Rams are in agreement on a two-year contract according to Ian Rapoport and Mike Garafolo of NFL Network. Clay Matthews recorded one solo tackle in the Packers' Week 17 loss to the Detroit Lions. Matthews' fourth single-tackle outing is a fitting end to a disappointing season for the veteran. Matthews finishes the season with 43 total tackles and a career-low three and a half sacks. 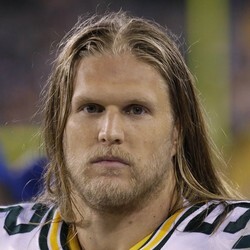 Clay Matthews recorded two total tackles (one solo) and a sack in the Packers' loss to the Chicago Bears in Week 15. Matthews has collected a sack in each of his last two outings after a tough five game drought. The veteran now sits on four and a half on the season and will look to finish an up and down season on a high note against the Jets and Lions. Clay Matthews recorded three total tackles (all solo) and a sack in the Packers' win over the Atlanta Falcons. If you forget about the ugly outing the Packers had against the Cardinals in Week 13, Matthews has been significantly better. Over the past four weeks, Matthews ended his five game sack drought and collected 14 total tackles, including back-to-back five tackle games. While these aren't eye popping numbers, it's quite the upgrade from the six outings in which Matthews recorded two or fewer tackles this season. Clay Matthews recorded a lone assisted tackle in the Packers' loss to the Arizona Cardinals. After Matthews went for a pair of five tackle outings against the Seahawks and Vikings, the veteran fell back into his struggles as he failed to collect more than a single tackle for the fourth time this season.